Trade Classics > Classic Car Blog > How do I find a good classic car trader? How do I find a good classic car trader? Classic car traders tend to be a different bread of people compared to new or used car dealers. The majority of these traders are car enthusiasts themselves, i.e. proper petrol heads and genuinely thrive on supplying the perfect classic car to match the new owner, and will always be there to give help and advice. However, the classic car market is minute compared to used sales – this stands to reason as the average age of the 31m cars on the road in the UK is only seven years. So there are fewer dealers and are a little harder to find. Actually one of the best ways to find classic car specialists is to take a trip to your local newsagent and check out the publications on offer. For example, Classic Car Weekly is a good source of information and has many dealers advertising their classic cars for sale. 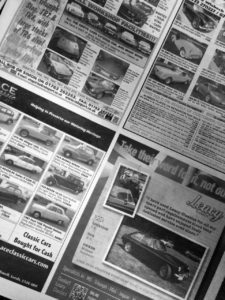 It comes out every Wednesday and is a mix of interesting editorial, classified car sales and specific dealer adverts. You’ll find a lot of general adverts, e.g. dealers that aren’t mark / model specific, however, you’ll also find specialists, e.g. ROBSPORT International purely trade in Triumph including the Stag, TR7, TR8 and TR6. So if you are purely interested in buying / owning a Triumph then it would be a good idea to call these guys up for a chat and arrange a visit. Action a Google search for classic cars in your town and county to see what dealers are local to you. Then pop around for a chat and see what stock they have in. I always prefer to visit a dealer as soon as possible as it’s difficult to build a relationship over the phone. If you’re interested in a specific trader then don’t forget to action a specific search on their company name to see what other people make of them and what their reputation is in forums. For example, Northway Porsche in Reading sell old Porsche cars that have been maintained or overhauled by them – they have particularly good feedback in forums and many Porsche owners trust their advice and cars they sell. Also, look at cars for sale on Internet classified sites like eBay Motors, Pistonheads and here on Trade Classics. You’ll find a lot of traders list their cars individually on these sites and are identified by the word ‘Trade’ as opposed to ‘Private’ meaning individuals selling their own car. When you find a trade seller they will almost certainly list their address and contact details – if you don’t see an address and / or landline number then it might be a good idea to walk on by. You may not know this but most car clubs let you join even if you don’t own an old car yet. As it’s your intention to purchase a classic car then joining a general or specific mark club could prove a wise choice. You will have access to the best advice as enthusiasts thrive on helping each other out and you’ll get good recommendations on what to buy, reputable traders and also what trouble spots to look out for when viewing vehicles. Look out for car shows locally to you and go along for a look. You’ll find lots of enthusiasts that are all willing to give help and advice for new / potentially new owners. As well as individual private exhibitors you’ll find people that make their living from trading in classic cars and see some of the cars they have for sale. This is a good way to meet these traders and see what cars they are selling and ultimately build good relationships / contacts. Even if you don’t buy a car from one of these dealers they could still come in handy for the future when it comes to sourcing parts or repairs / restoration. Don’t forget, if you have any other advice that you’d like to share on how you found a good trader, or would like to recommend a particularly good one then please drop me a comment below. This article was written and published by Emma Jones. Emma works for Trade Classics as an in-house journalist and copywriter and has many years’ experience in the classic car sector. Why not write a reply on this article below – she’d love to hear your thoughts on her thoughts! Also, don’t forget to check out the classic cars for sale here on Trade Classics.